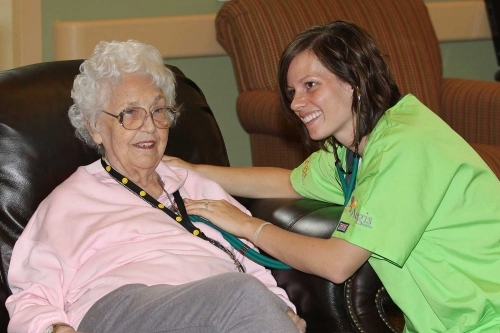 Two primary services will be offered in the Maple Springs Skilled Nursing Facilities. The first is Transitional/Post-Acute Care, which focuses on the rehabilitation of the residents leading to an eventual discharge to home or a lower level of care such as an Assisted Living. The second is Long-Term Care, which focuses on residents with chronic health conditions and limited mobility. These residents are typically unable to live safely at home and exceed the acuity limits within the licensure of an Assisted Living Facility. To help patients in both transitional and long-term care, our community boasts state of the art rehabilitation services. This includes a physical therapy rehab gym, an occupational therapy section that offers a residential kitchen complete with common household appliances and a bathroom similar to one you would find in your own home. These unique accommodations allow our therapists to retrain the residents on their personal care in settings that are very familiar to them. We will also offer an expansive speech therapy service to assist patients with swallowing, cognitive/impairment delays and much needed rehabilitation from strokes. Did we mention our outdoor therapy program? These are just a few of the many reasons why rehabilitation in the Maple Springs homelike neighborhood provides our seniors the physical and psychological care they deserve!